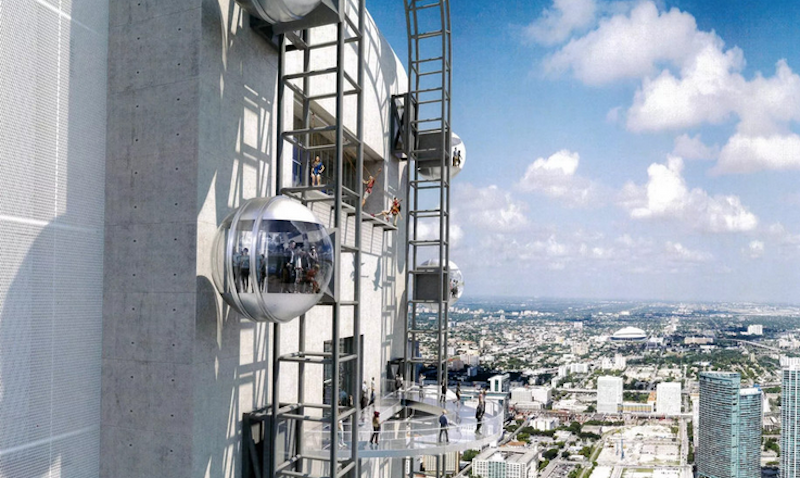 SkyRise Miami to offer some hair-raising attractions. SkyRise Miami, a 1,000-ft tall entertainment and observation tower, is set to begin construction in the first quarter of next year, according to Plaza Construction, which recently was chosen to build the structure by its developer Berkowitz Development Group. •Skyplunge, a base-jumping feature where jumpers attached to a high-speed descent wire plummet at nearly 55 mph. •Skydrop, where riders slowly ascend more than 600 ft and then drop 540 ft at free-fall speeds up to 95 mph. •SkyRise Flying Theater, where up to 72 riders are secured in seats that, when the floor drops out, are suspended 40 ft in the air. A 4D simulator moves the seats in sync with a movie projection, supplemented by real special effects like wind and aromas. The ride will last six minutes. •Skyway, which will bill itself as the world’s tallest rotating observation attraction. •Skyfly, a zero-gravity tunnel that allows visitors to float to the top of the tower. •Skywalk, where tethered strollers can walk out onto an open deck with no handrails, 908 ft above ground. 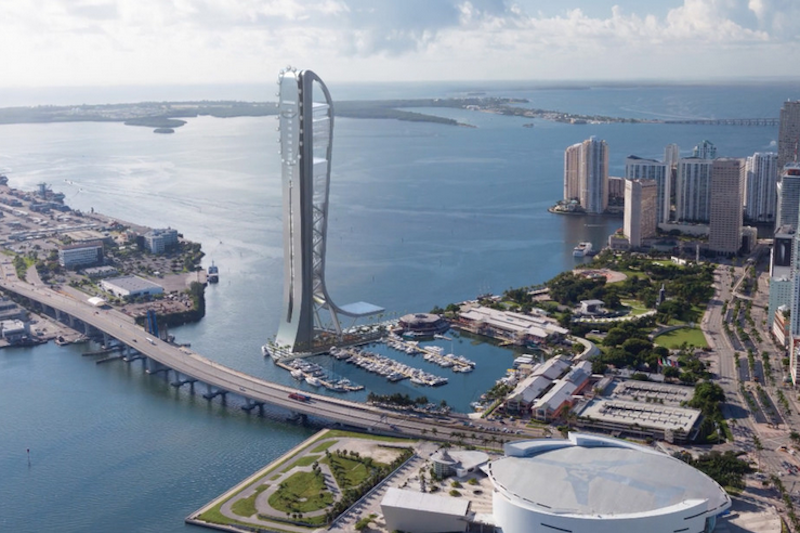 •Skyglide, whose transparent slide allows visitors to “glide” outside for a panoramic view of Miami. •Skyledge, whose transparent skydeck cantilevers off of the structure’s outside wall, 866 ft above ground. There will also be scenic boat cruises and virtual reality experiences available to visitors, as well as catering halls, restaurants, and nightclubs. Coconut Grove-based Berkowitz Development Group’s portfolio includes more than 1.5 million sf of office and retail building development. Its Building Team for SkyRise Miami, besides Plaza Construction, includes Arquitectonica (architect), Magnusson Klemenic Associates (SE and CE), Cosentini Associates (ME), gsmprjct° (exhibition design), and DVS (engineering consultant). Legends, a joint venture of the Dallas Cowboys and New York Yankees, will operate SkyRise Miami. This is the eighth project that Plaza and Arquitectonica have worked on together. Brad Meltzer, Plaza Construction’s CEO, tells BD+C that the tower’s unique design presents challenges. “The building is void of uses from the podium to almost 500 ft, making the planning of the structure more complicated,” he explains, adding that the structural steel and concrete design that’s being contemplated hasn’t been tried before in South Florida, and will require more upfront integration of fabricators and tradespeople in the planning process. While some press reports have pegged SkyRise Miami’s construction cost as high as $400 million, Meltzer says those costs have yet to be finalized. SkyRise Miami will be built on land that juts into Biscayne Bay. Image: Berkowitz Development Group. Miami’s city commission and Miami voters approved SkyRise Miami in the Summer of 2014, but the project had been delayed by litigation. Jeff Berkowitz, chairman and founder of Berkowitz Development Group, initially claimed that he could complete the tower without taxpayer money, but he subsequently applied for $15 million in economic development funding. A lawsuit attempted to block Miami-Dade from allocating $9 million in property taxes for SkyRise’s development and construction. Other suits accused the landowner of skirting competitive-bidding requirements, and objected to the tower on environmental grounds. A 2015 Florida Supreme Court ruling in the developer’s favor effectively ended opposition to SkyRise moving forward. The team will also redevelop the Coliseum site.